Grand River Transit recently announced a list of proposals for the 2015 Transit Improvement Plan. 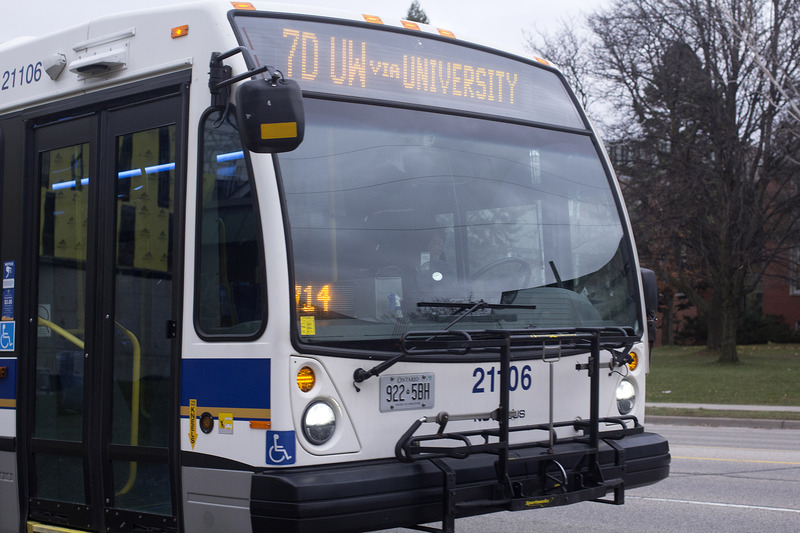 One of these proposals outlines the elimination of the 7E and D branches of the route 7 bus, which service the areas surrounding the two universities in Waterloo. GRT gave several reasons for eliminating the 7D and E busses, noting the proposal mostly has to do with the upcoming ION light rail transit service. “We know that down the line once ION rail service is running in a few years, the 7D and E are going to be pretty duplicative of the rail service,” said Reid Fulton, acting supervisor of transit development at the Region of Waterloo. The other main reason that GRT is considering eliminating the busses is due to the fundamental setup of the route 7 bus system. “We know that there is a certain complexity associatedwith the way the route 7 is setup with the six different letter branches, and we’ve heard from the public in the past that it is confusing,” said Fulton. The route 7E and D busses have their stops based at the University of Waterloo and are primarily used by university students. Although the proposals would replace the busses with additional 200 iXpress busses, there is still some concern from students who frequently use them. “The 7D/E busses go all the way around UW campus, and if they take it away the students that take the night busses to get home wont be able to,” said Zayan Imtiaz, a first-year student at UW. GRT is also looking into how they will ensure continued service for riders of the 7D and E if those busses were to be cancelled. The main suggestion has been to facilitate additional busses of other routes and integrate busses with the ION rail stops. “We would be looking at providing additional trips on other routes, like route 7, that would remain on King Street and routes on University and Columbia to mitigate the change,” said Fulton. One key factor in whether GRT will adopt this proposal is public perception and feedback. They have been hosting public consultation sessions to get feedback from riders in Waterloo, with the last session being hosted on Nov. 26 at Emmanuel Village. Riders can also give their feedback on upcoming proposals using GRT’s customer service phone line. “We’re trying to gather feedback from riders and particularly students in the Waterloo areas on these proposals before any decisions are made,” said Fulton. I don’t understand. How does walking across campus to the Davis Centre to catch the iXpress 200 instead of catching the 7D or 7E on the Ring Road prevent people from getting home at night? Route 7D/E is not a moving sidewalk, and people boarding it to avoid a 500m walk to the plaza is kind of absurd. Granted, more could be done by GRT to explain how increases in frequency to the many other routes traveling the University Ave corridor (in particular, Route 8) will supplant service University Ave and what the role of the 92 will be in the future.